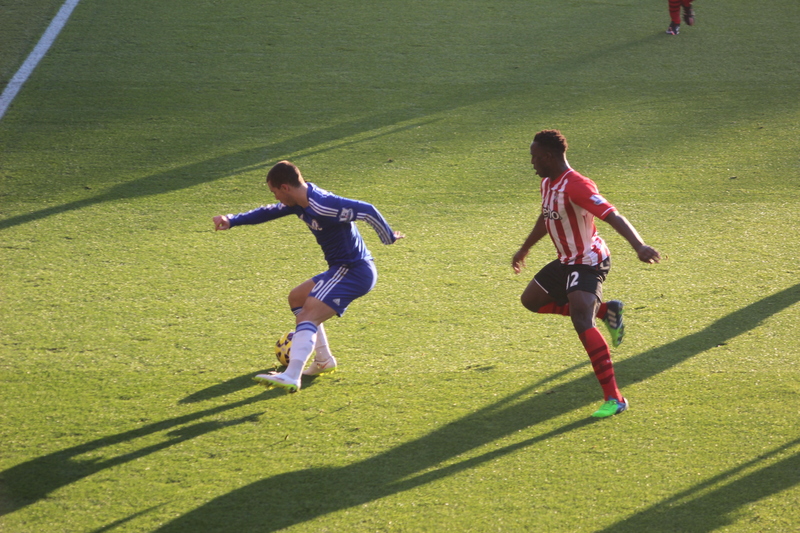 Southampton vs. Chelsea : 28 December 2014. It was almost a complete year since our last visit to Southampton. On New Year’s Day 2014, I travelled the relatively short journey to the city on the South coast with Glenn and Parky. It was a day of torrential rain, but of also a fine 3-0 win. There was no Boxing Day game for me this Christmas – other priorities took precedence – but our play looked sumptuous at times against a surprisingly lack-lustre…or “crap” to be more succinct…West Ham United team. There was a different type of inclement weather this year; bitter cold. Parky met me at my house for a change and we were soon on the way in to Frome to collect PD. Both were unfortunately suffering with severe head colds. By the end of the day, I wondered if I would be too. Southampton is only ninety minutes away and I was parked-up, on target, bang on 11.30am outside the city’s featureless train station. This was the same scenario as last season; in fact, as I type these words, I am aware that my footsteps in Southampton in December almost exactly mirrored those of January. This is a shame really – it is always nicer to experience new sights on these away days. I’m not particularly taken with Southampton though; it must have some, as yet hidden, charms. As with 362 days previously, we based ourselves in the heaving “Yates” pub in the centre of the city. Unfortunately, the service was dreadful, but we were eventually served. In a little corner, again eerily similar to last season, there was a small conclave of Chelsea supporters from the Somerset / Wiltshire border. Mike, from further afield – Brooklyn, New York – arrived via a tortuous train journey from Kent and it was great to see him once again. Not only were we drinking in the same locale as in January, but the same music was playing too. At around 1.15pm, we needed to set off for the ground. Parky and PD were without tickets at this point, and I needed to collect them, on their behalf, at the stadium. Via a brisk walk, we soon reached St. Mary’s. While I waited for the tickets, I had time to spot a huge sign on the stand wall which typifies how clubs try to engage supporters these days using words to stir the emotions and help create a bond between team, club and supporters. I spotted something similar at Everton in August. There is none of this hyperbole on show at Stamford Bridge, although there was a short-lived ‘’We Are Chelsea’’ tag line a few seasons ago. Maybe we don’t have to try too hard to engender a sense of belonging – but at least it adds colour to an otherwise dull stadium façade. In the modern era – or post-modern, I’ve lost count – I find it increasingly popular for clubs to use their stadia as a canvas, sometimes on a huge scale, for such shows of belonging. We had the pre-game light show versus Tottenham a while back. It was pretty impressive; although I am not sure it needs to be repeated too often. I have a feeling that it could easily grow tedious. Maybe save it for the big games. The most ingenious use of stadia that I have seen recently was from the pre-game show at a Montreal Canadiens ice-hockey match, when video images of team players were superimposed on the ice itself. Maybe Chelsea can superimpose iconic images on the hotel wall before night games; Graham Wilkins scoring an own goal, Chris Sutton slicing over from five yards or Darren Wood getting stranded in midfield. Maybe with the God-awful “Proper Chels” tagline. After a slight delay at the turnstiles, we were in. The concourse under the stands at Southampton always seems to be particularly dark and gloomy. The difference between the inside and outside could not have been more spectacular. As I steadily climbed the small array of steps into the seating area, the brilliant blue sky – no clouds at all – and the low sun meant that the light was searing in its intensity. Even with sunglasses on, the light was blinding. I soon located Alan and Gary. The game began with me still trying to work out who was playing and where. There were several changes since Boxing Day. Thibaut – Brana, JT, Gary, Filipe – Mikel and Matic – Cesc, Eden, Schurrle – Diego Costa. The Chelsea choir were in good voice from the start. The pubs and bars in the city had obviously made a killing from hundreds of away fans. But that damned sun. Myself, and hundreds of others, ended up shielding our eyes from the sun with our hands. I mused that not so many years ago, away terraces at Chelsea games often used to house hundreds of fans raising their right arms, but with far more nefarious a reason. It was odd for Chelsea to be attacking us in the first-half, but I am sure that the sun was a major factor. JT obviously thought that it was more advantageous for Frazer Forster to be facing it than our Thibaut. We began lively enough, but Southampton more than matched us. They threatened our goal but shots were saved and blocked. The sun made viewing – and concentration – difficult. I didn’t enjoy it at all. I even missed the Southampton goal on seventeen minutes. I was too busy looking at the two managers, Mourinho and Koeman, observing the play like spectators at a tennis match, their heads moving as if synchronised; left, right, left, right. I looked up just as Mane slipped past JT to plant the ball past Courtois. This was not expected; despite the home team’s fine form thus far this campaign. The home fans momentarily roared but then returned to a rather docile state. I looked over at a section of home fans adjacent to our segment; they looked neither happy nor even contented. I felt a tinge of pain – for want of a better word. It felt like they were making light of who we were. There was the occasional “Oh When The Saints”, but St. Mary’s was mainly quiet. Over on the far side, there was a “We March On” hoarding at the back of the stand, but St. Mary’s is quite a bland stadium, especially compared to the cramped yet wonderful and idiosyncratic Dell. I will be honest. I thought we were pretty poor in the first-half. Yes, Southampton pressed us, but our verve and drive was sorely missing. With the sun still annoying the crap out of me, this was a game that I was simply not enjoying. The minutes passed. I was ready for a spirited Jose team talk at the break to inspire us in the second period. Then, a miracle. A magnificent ball from Fabregas found Hazard. He soon brought the ball under control and quickly advanced. With amazing speed, he ran at two Southampton defenders, glided past both and shot – snap! – into the goal. Phew. Wild euphoria in the away section. The whistle for half-time quickly blew. The general agreement was that we had not deserved the equaliser. Saints had been the more impressive team. I think can still taste the bitterness of the smoke now. Willian soon impressed with his – here I go again, I wish I could illustrate his play with words other than these – urgency and energy. Two shots were blocked. Then a Chelsea player fell in the box, but no penalty was given by the referee. Although the sun had now dropped below the level of the stand roof to my right and I could now watch in comfort, the challenge was simply too far away for me to judge. Fabregas – it was him – was booked for diving. “Red and white” – clap, clap, “red and white” – clap, clap, “red and white” – clap, clap. We now dominated the game and the Southampton defence needed to continually readjust as we came at them time after time. Hazard went close, then Diego Costa. At times our ball retention was a joy to watch, but it also became a little frustrating. We were overplaying at times. There was an annoying reluctance to shoot. We lost count of the number of times that intricate passes on the left ended up with a long ball out to Ivanovic on the right. Extra artillery came in the form of Didier Drogba, who replaced Mikel, who had enjoyed a fine game. Our fabled striker soon linked up well with Diego Costa. Chances were rare, though. Neither ‘keeper were too busy. Courtois was more involved at Stoke. Schneiderlin was booked – his second of the game – for a crude challenge on Hazard, and received his marching orders but there were only a few minutes left. Loic Remy replaced Diego Costa. A few late Chelsea chances peppered the home goal, but I was never convinced that a goal was forthcoming. This was a well-marshalled Southampton team and they had denied us our usual high number of efforts on goal. At the final whistle, it felt like a loss. There were groans on the way out from the assembled Chelsea masses – Manchester City were already two up at home to Burnley – and the game at Tottenham suddenly became even more important than before. However, it had been a fair result. We had been poor in the first-half and despite our lengthy spells of possession, never looked like winning it. The three of us met up outside and began the long slog back to the car. The temperature had dropped further and it was a tough walk back. I was in two minds whether or not to turn “Five Live” on, but I am a creature of habit. There was a tirade from Jose about a vendetta against Chelsea and our manager seemed supremely annoyed. Manchester City, possibly our only real threat for the title – though United are getting worryingly close – then imploded. And how. Two Burnley goals in Manchester caused the three of us to bellow as my car headed towards the waiting M27. On a day which marked the halfway stage in the campaign, it was left for our opponents in our very first game to take two massive points away from Manchester City. What an amazing and unexpected end to the first-half of the season. We are 14-4-1 and on Thursday we go again. This entry was posted in Season 2014-2015 and tagged 2014-2015, Eden Hazard, Songs, Southampton, Stadia by Chris Axon. Bookmark the permalink.